Considering current situation in Sri Lanka under which number of LTTE Tamil terrorists had been released from the prisons and ban on Tamil terrorist organizations had been lifted and number of security forces members taking in to custody Global Sri Lankan Forum has written to ex-servicemen. 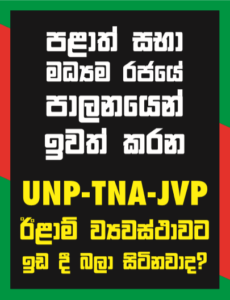 The foreign funded NGOs who were in the driver’s seat during the Chandrika-Ranil failed regimes, campaigning vigorously to brainwash the country from top political hierarchy to grass roots level, spending billions of rupees are back in the driver’s seat once again. The penetration of NGOs into the country began in the 1980s. Manipulation of public opinion by making use of the media and the so-called ‘think-tanks’ , who were none other than paid agents of the spy agencies, is one of the usual methods adopted by the West to create distrust among communities leading to the loss of faith on the country’s rulers and thereby to achieve ‘regime changes’ .